Plus Tanya shares a simple “hack” for dealing with the impostor complex when it rears its ugly head. You’re going to want to listen to this one. Click the play button below, or scroll down for a full transcript. Rob: What if you could hang out with seriously talented copywriters and other experts, ask them about their successes and failures, their work processes, and their habits, then steal an idea or two to inspire your own work. 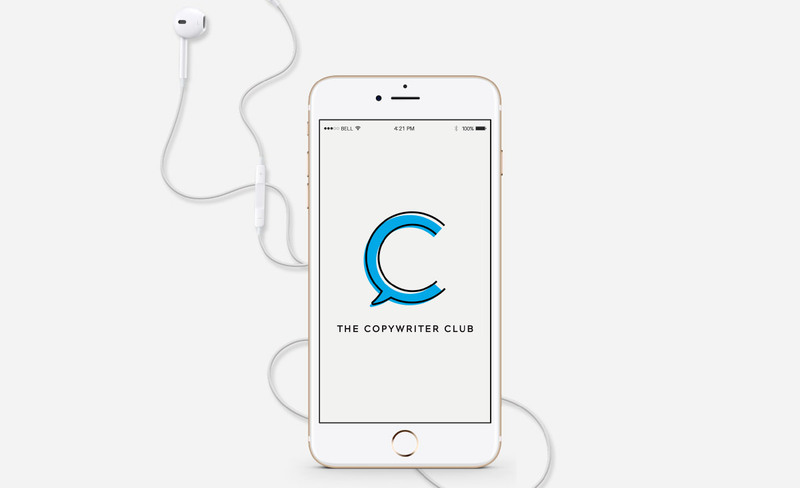 That’s what Kira and I do every week at The Copywriter Club Podcast. Kira: You’re invited to join the club for Episode 47 as we chat with leadership coach Tanya Geisler about the Imposter Syndrome and owning your authority, working with a coach, amplifying your voice, and how copywriters can deal with the comparison trap. Rob: Hey, Tanya. Hey, Kira. Tanya: That’s so much for having me. Real excited to be here. Rob: We’re excited to have you here. Kira: Yeah. Tanya, you were recommended from one of our club members, Helen, who said that all the conversations in our club right now are … Well, not all of them, but a lot of them are around feeling like an imposter, a lot of self-doubt, especially because we have a lot of new copywriters in our club. This is what you talk about day in and day out. So we’re really grateful that you’re here to kind of just address this challenge that we all are facing head on, and hopefully we can help some copywriters along the way. Tanya: May it be so. Kira: A good place to start is with your story. You know what, especially as I’ve heard you, I’ve heard your name in the past, watched your TED video, checked out your website, and you’ve stepped into your starring role, but I always wonder, when did you do that, and was it easy for you? Were you always in a starring role? Could you tell us your story? Tanya: I want to laugh. The first thing I want to do is laugh. Yeah, it was so easy. No, not much about this has been easy at all. It’s been tons of self-doubt, tons of, “What do I know? Who am I?” I talk about there are 12 lies that the Imposter Complex wants us to believe. And I believed them for probably the first … Even if I put a name, a number on this, I worry that it’s going to trigger people, but really and truly for probably the first four to five years of my work as a leadership coach I was really coming up against the Imposter Complex, like huge. And what I started to recognize was this through line that was inhibiting me from stepping into my starring role. That wasn’t the language that I would’ve had back then, but the through line that was inhibiting me from being the fullest expression of the kind of coach leader that I wanted to be was very similar to the same through lines that were riveting through the experience of my clients. When somebody named the Imposter Complex, I swear to you it was like I heard the angels sing. It was this like, “Oh, it has a name.” It just really dialed things down for me in terms of my self-doubt, and it really then dialed up my sense of purpose and what I was here to help others and help others heal in themselves. Kira: Can we start with what exactly the Imposter Complex is? Tanya: Yes. I always start with a history lesson. The Imposter Phenomenon is the term coin termed by a clinical psychologist, Pauline Clance and Suzanne Imes back in 1978. So they were working with high-functioning, high-achieving women, as it happened, and they noticed that with these women, in spite of consistent and irrefutable data to the contrary, these women seemed incapable of internalizing their success. It didn’t matter what they had done; they would attribute anything that they had done spectacularly well to luck, or fluke, or timing, or having deceived somebody into thinking that they were actually smarter or more capable that they actually are. Failures, on the other than, they were more than able to internalize. So something went wrong, “That was all my fault.” This was the consistent piece that they kept seeing in all these women that they were working with. They were high-functioning, like I said, high-achieving women with strong values in mastery, integrity, and excellence. So I always start there. If you’re experiencing the Imposter Complex, then you are high-functioning, high-achieving with strong values of integrity, mastery, and excellence. That’s always the really good news. The other thing I always want to say when I start talking about this is that you often hear Imposter Complex as synonymous with Imposter Syndrome. Syndrome is actually not correct because that denotes a clinical diagnosis, and this is not a clinical diagnosis. This is an experience. It’s a phenomenon, and it is a complex. Rob: Dr. Rob and Dr. Kira diagnosing your internalized failures, right? Tanya, you mentioned that this is a big deal for women. What about men? Do men also have the complex, and what are the differences? Tanya: Yes. The short answer is men absolutely experience it. Most of the data points to women so far because that’s where the research in a very substantial way is started. Valerie Young continued the research with her books, Secret Thoughts of Successful Women. So once again, men absolutely experience it, but there’s a couple more things to it. One is that it’s actually bioevolutionary in context. We experience it as a way of preventing evolution from happening too quickly. So it shows up on the precipice of something new. The way men and women tend to deal with something new is very different. We have lots of information that points to men needing to feel about 60% prepared to take on the next task, whereas women need to have a much higher level of assurance to feel like they’re going to be able to do the task. So men are more likely … I’m really being mindful of the language here because I could see it’s so black and white as I say it in that way. But men tend to be more like, “Okay, I don’t know everything, but I’m still going to go for it,” whereas women, the way we are raised, the way we are taught, the way we are socialized and conditioned is very different, and there are six behavioral traits that are coping mechanism that are more unique to women in that it … And women identify people, I should say, as well that really further entrenches us in this imposter complex experience. I also want to say too that it’s men. It’s women. It actually doesn’t discriminate. It wants to make sure that you feel separate from everyone else. So if the center of the universe in your industry is the white male, the further you are from that identification, the more you’re going to feel it. So as a woman of color, you’re going to feel it more. If you’re not able-bodied, if you’re of a different class, if you’re a different … So all of these contributes, so there’s this real intersectional piece too that we really need to be mindful of. So we talk about men. We talk about women. But the farther you are from that epicenter of the universe, your industry, or the experience, the more you’re going to feel it. Does that make sense? Rob: Yeah, totally makes sense. We should note that when we generalize across a gender, we’re talking about 3.5 billion people. And so everybody obviously is going to have a different level of experience and feel this in different ways. Tanya: Certainly, and I think it’s important here just to touch on what those behavioral traits are because so much of it speaks to the different kinds of conditioning that we show up with. Again, though, I really want to hold sacred that men absolutely experience this, like huge. And the strategies that we’re going to talk about apply to absolutely everyone. That’s the other good news. Rob: Before we get to the lies and the coping mechanisms, I want to ask, because obviously this is a natural phenomenon, there’s got to be like a genetic reason that we feel this. It’s protective in some way, or it’s defensive. So it’s great that it’s natural, but we also need to recognize that while it may hold us back, it also helps us in some ways, right? Tanya: Yep. It keeps us safe, has for lots of years. So, yes, it’s evolutionary and contact. So our job… And thanks for bringing that in because this isn’t about cutting it off, shutting it down, never experiencing it forever and ever, amen. It’s actually a really important part of the ways in which we have achieved excellence. The way that we keep striving and the way we keep pushing our own edges, it’s important that we recognize that one of the most important things that it tells us is that there’s room for improvement. As high-functioning, high-achieving people, this is really good news. So there’s all these lies that want to keep us held back, but that nagging belief that there’s room for improvement, that’s what keeps us striving towards mastery. That’s what keeps us on our edge, and that’s what has actually helped us to be these people who have strong values of that mastery, integrity and excellence. Kira: Yeah. I was going to say as you were talking about this, there’s part of me that’s like, “No, no, no. I want to cling to my Imposter Complex,” because in a way I feel like it allows me to push myself, and I kind of cling to it because I’ve told myself a story that this is what keeps me humble. This is what helps me grow. I need it. I don’t want to get rid of it even though I also kind of hate it. So it’s like this strange relationship with it. Tanya: Absolutely. It’s like fear. We know that we’re never going to completely eradicate fear, but we just need to recognize that it’s here, what it’s here to tell us, and then move on in spite of it, do our due diligence. Again, masterful people with integrity and excellence, that’s what we do. Our job is to recognize what it’s here to tell us and to move forward. So it really does three primary things, or it has three primary objectives. One is that it wants you to doubt. It wants to keep you out of action. It wants to keep you low, doesn’t want you to get pegged off by the pterodactyl, if this is pretty ancient. It wants to keep you doubting your capacity, and then it also wants to keep you isolated. These are the tree things that it does time and time and time again. When we start to look at how those strategies, how we apply the strategies against those objectives, then we’ve got a fighting chance here. But, again, it’s here to remind you that what you’re about to do is really important to you. I think it’s also important to remember that … And I feel like I’ve said “important” about 100 times already in this call. We’ve been on the phone for about 10 minutes, so clearly this is important stuff for me. You don’t experience this in every area of your life. Glory be. Hallelujah. You really only experience it in the places that are new and emergent for you. If you’ve got kids, the idea of facing down the barrel of parenting was so much more than you could even begin to imagine, and the fears, and the, “I don’t know what I’m doings, and they’re going to find out that I don’t know what I’m doing, and, and, and.” We just had to get through the act of parenting. We had to just start to be a parent. The first time we were asked to manage, or the first time we were asked to do a pitch, all of these firsts, when we were starting our business, when we were starting are career, all of these firsts are this place of self-doubt, to be certain, and then skews right over into the Imposter Complex where we have proven track records in specific areas, and we still discount it, and we still externalize the success and internalize the failures. What I’m trying to say is I’ve got a yoga practice. I have zero need to become masterful in yoga. I have no need for that. My parenting, very important to me. My work as a leadership coach, very important. My authorship, my speaking, these are really important areas. So this is the place that it shows up for me. As a citizen of the world, as a yoga practitioner, as an artist, not so concerned about it. So it’s just to remind you that’s here to tell you what’s really important to you as well. Kira: You mentioned isolation, that that’s part of the Imposter Complex, wants you to feel isolated. Why is that part of it? What’s that connection? Tanya: It wants you to feel outside of the tribe. The response to that would be to conform, to not swing out too much. This is why we’re afraid of success. That’s why we’re afraid of failure, because either ends of that spectrum, we’re going to be outside of the norm, so it’s always trying to point those places out. It wants you to believe that you’re alone, so it starts to tell you you shouldn’t tell anyone about this. Your experience at the imposter, don’t let anybody find out. Your job is to just … You’re supposed to want to belong. If you’re feeling on the fringes, then you’re feeling unsettled. It’s harder for you to continue to move forward and be that pioneer. That way we don’t mutate too fast. That way we don’t evolve too fast. Rob: Tanya, at the top of the show you mentioned the 12 lies of the Imposter Complex. Can you tell us what some of those are? Tanya: The first is, I almost feel like this is the only lie we need to know, your self-doubt is proof of your inadequacy. So the fact that you’re feeling self-doubt means that you’re inadequate. The fact that you … How can you possibly be a leader when you are experiencing self-doubt? How can you possibly be a confident writer if you’re not feeling confident? So it’s just right off the bat self-doubt is proof of your inadequacy. The truth, of course, is that self-doubt is proof of your humanity, not your inadequacy. That’s the first one. Successful people don’t experience this, is the second lie. So we really love to think that everybody else has it so much better than us; we are the only ones who are sitting in the stew of awfulness. But I just point people to how relieved they feel when they hear that Neil Gaiman has experienced this and talks about it quite vocally. When his partner Amanda Palmer talks about the fraud police, we feel such relief when we hear that. Meryl Streep said, “I’ve been nominated for an Oscar 18 times, and I keep thinking, ‘This is the movie they find out that I can’t act.’” It’s amazing, right, and Maya Angelou. So we feel this deep sense of relief when we hear these people at the top of their game experience it. Then we know that we are in exquisite company. We are so far from alone. We’re in exquisite company. The third lie is that you are all or nothing because it loves to speak incompetence extremities. You are either a raging success or a dismal failure: all or nothing. This one is probably, if I had to go ahead and make up which lie is the one that copywriters feel the most, and, again, I’ll be making that up. I’m not positive that that’s true because I think all of these lies apply to your listeners to be certain, but you have nothing useful, valid or original to say. I think that lie #4, and I think that that is probably up the most. So when we believe this lie, we don’t say anything. We don’t communicate. We pass up opportunities to collaborate with our peers. We don’t say what needs to be said. Does that sound about right? Kira: Unfortunately or fortunately, all of these are hitting home for me. I was just thinking back to the you were all or nothing and that extreme #3. I’ve definitely told my husband in conversations just like, “This project is make or break for me, and if I don’t do well on this project, my business is done.” It’s so extreme and so wrong, but I don’t … I guess that’s why I do it. It’s the Imposter Complex. By the way, can I just sidebar here? When did Starbucks become the Plan B of everybody? “I’m just going to quit this and get a job in Starbucks.” I don’t know when that happened, but what is that? Really? It’s all or nothing? Lives are at stake here? So just bringing that level of curiosity into the equation starts to crumble. It really starts to crumble. Rob: Yeah. You just described I think 80% of my conversations with my 16-year-old. It’s that extreme. It’s the very best thing in the world, the very worst thing in the world. So we’re basically dealing with our inner 16-year-olds. Tanya: Hey, now, that’s exactly it. That is exactly it. John Lennon said, and I’m going to get this wrong, I think, at this moment, but, “Part of me suspects that I’m a complete loser, and the other part of me thinks I am God Almighty.” Somewhere in the middle is the truth. So that’s our job is to find what’s in the middle. What’s in the middle? Lie #5 is you must not tell anyone about this. So it likes to pay you hush money. Just keep it on the down-low. Don’t let anybody know. But really and truly your job is actually to name it. Your job is to say, “I’m nervous to be doing this and excited because it matters,” right? Tanya: Everything’s a contradiction, so lie #6 is you must tell everyone about this, right? So you have to make sure that you are constantly telling everybody how insecure you feel. This is really tricky one, where we really believe this one. I have to tell everyone about this, head it off at the pass, make sure that everybody’s aware that I’m the imposter. This can be really tricky. Particularly if you’re on a management position, this could truly erode some of that cohesion on your team. So just be mindful of that. Kira: I feel like I’m constantly in between there. Am I oversharing? Am I being too vulnerable with clients or even if you’re coaching or teaching a program. Am I sharing too much or is it not enough? Tanya: I find that super helpful to just think about, “Am I puffing up? Am I shrinking back?” and even more so just to pause and ask yourself what is the intention behind the sharing. First of all, I think pausing at any time is a great practice for life. We don’t pause enough, if I’m being honest. Just literally put the pause button and ask yourself, “What is my purpose for sharing right now?” when you feel like you might be slipping into the land of oversharing, particularly for us people-pleasers, and I’ll say a bit more about that if there’s time. “Am I looking to connect? Am I looking for sympathy? Or am I looking for something else?” so just getting clear in that moment, “What is the intention for me to overshare? Am I looking to bridge? Or am I looking to get some validation?” Then when we are clear about what that is, then I think we know what to say and what not to say. Tanya: Lie #7: You’re not ready yet. This one, oh my gosh, is really tricky because it’s finally giving you a little slack—finally, right? It’s been like just beating it for the first six lies, but now it’s finally giving you a bit of slack. It’s saying that you’ll be ready one day, but, sugar pie, that day is not today. Maybe when you have got your work in the next three publications when you’ve got 10 more clients, you’ve got 100 more hours, you’ve got the next degree, then you’ll be ready, but that day is just not today. Rob: I think we see that one all the time with the people in our club, copywriters especially. It’s like, “Well, I need to read this one more book, or I need to take this other course.” That one totally hits home. Kira: But aren’t there times when we just aren’t ready, and we should climb the ladder? I’m just thinking of copywriters who maybe they’ve worked on a couple projects, and they’re like, “Hm, I think I can start teaching copywriting.” Maybe they’re just really not ready. Kira: Or is that something else entirely? Tanya: Maybe they’re not, but they’re going to find out. So they can find out, and they’re going to be told. They’re going to be told enough nos or they’re going to be … So we just have to dial down the impact of what that no means because 9 times out 10, when we’re talking to somebody who’s really in this experience of it, that person who is going to write the one article and then offer a whole course on writing articles, that’s not the person who’s experiencing the imposter problems. Kira: That’s true. Good point. Tanya: So it’s the person who’s like done, and written, and been published here, and been published there is going, “I’m not ready yet to release this course. I’m not ready yet.” That’s that person, so that’s the person we’re oriented ourselves towards right now. Kira: What? That’s so unfair. Tanya: I know, right? It is, but it’s this great fail-safe things. If I’m feeling like an imposter, probably not an imposter, right? This is where you can start looking at the proof around you. If you can’t see it, this is where one of the strategies comes into play, where we start bringing other people in. But the truth of the matter is there is something called the Dunning–Kruger effect, and it always comes up every time I do any kind of a talk because people are like, “Yeah, but aren’t there people who have massive amounts of confidence and very little capabilities?” I’m like, “Mm-hmm (affirmative), that’s called Dunning–Kruger effect.” They’re not worried about being the imposter. They should, but that’s not actually who’s here in the clubhouse right now asking these questions. I just hope that that offers us a bit of (deep breath). That’s my intention. Kira: A little bit. It does help. Rob: The second record is never as good as the first. The second book is never as good. Tanya: That’s it, right, the one-hit wonder. That’s what happened to Chumbawamba, right? They gave in to the Imposter Complex. That’s what happened there. Rob: So many ‘80s bands that I can think of with the one hit, yeah. Kira: I feel like, Rob, when you edit the show, you need to add some Chumbawamba in here right now. I think of #8, “You’ll ever be able to pull this off again,” to me I think of that in my business with projects. When a client is happy with your work and they come back, which is a good thing, but I definitely have had moments where I’m like, I kind of want to work with all new clients all the time because then I’m always the underdog trying to prove myself and not trying to follow up one of those hits and dealing with the Imposter Complex. Tanya: But, of course, how good will you allow this to be? What if you don’t even know the next places that you can blow their socks off? You’ve only experienced blowing the sock off. What if you blow like the entire outfit off? You don’t know because you’ve never really … Right? So just hold the possibility, but that’s what happens next, that minds get blown, not just socks. Kira: As you said, all the clothes get blown off. It’s a great visual. Rob: I might have to find something to link to for that as well. Kira: Lots of visuals, audio, notes here. Okay. Tanya: It’s just a matter of time before this all crumbles beneath you. This is the next lie. This is where we stop. This is where we also lay low. It’s trying to keep us out of action, so it’s all just a matter of time before this crumbles beneath you, so this is where we start to dress rehearse disaster. This is where we stop appreciating. This is where we stop creating, because what’s the point? We’re never going to be able to top this. This is where I really challenge you to think, what if the other shoe wasn’t about to drop? How good will you actually allow this to be? Tanya: We think they’re just being nice. It’s really actually painful when we can see that, when we can feel the way that we dismiss the acknowledgments, we dismiss the praise of others. We so desire it, but we dismiss it. So really our job is to dare to believe someone that when they tell us how remarkable we are. Just dare to believe them. Dare to believe what they’re reflecting back, and then say the two words that the Imposter Complex hates more than any other words. Do you know what they are? Rob: it’s got to be “Thank you” or “You’re right. Tanya: Yes! “Thank you” and “You’re right,” but, “Thank you.” We just, Imposter Complex hates that because we’re already borrowing this truth. It does not like that whatsoever. Rob: That one goes way beyond work relationships as well. That’s personal relationships. I think the ability to accept a compliment and believe that it’s actually real and not just somebody trying to flatter you or make you feel good, that’s tough I think for a lot of people. Tanya: Can I just tell you that each one of these lies is a massive body of work unto itself. We could talk all day on each one of these lies because they are so rife. But I think that our job when we receive an acknowledgment is to recognize that it’s intended as a gift. So just like you receive any gift, it might not fit. You might be allergic to the mohair of the sweater, you might, but the intention behind it was true. The intention was coming from a really beautiful place. It just might not fit you. So I just invite people to think that this might not be your capital T Truth, but it is somebody else’s capital T Truth. So just dare to believe that, and then receive it as the acknowledgement, as the gift that it was intended and say thank you. Tanya: Yeah. So your people want you to succeed, your people. I think that that’s, as we get more sophisticated, we start to know who our people are. Not everybody actually wants you to succeed, not everybody does. That’s just true, but your people do. Kira: That’s a good point. Tanya: So you’re going to have to fake it until you make it is lie #11. Kira: Ooh, that’s a good one. Tanya: I got in so much trouble for this one last week at that speaking gig. And I’ve actually had dinner with Amy Cuddy when she was in Toronto. Last March she was here. She was doing a talk. It was hilarious. You know Amy Cuddy’s work, right? Tanya: A TED Talk. It was hilarious. At one point we stepped out to have a little chat. All these people kept coming up to her. I wish you could see me right now. You could imagine. They’re like, “Amy Cuddy!” They’d go immediately into Wonder Woman power puffs. The number of selfies that that woman has to take with people, the Wonder Woman pose, and arms, and spread-eagle, it’s quite hilarious. Anyway, so she has done a huge body of work on power poses. And there’s obviously some really important science underneath physical manifestations of these power poses so that you can borrow confidence until it’s baked right into you. So that’s the one part. She does speak about faking it until you make it in her first TED Talk. She’s revised it a little bit too. I think she said something like fake it until you become it. So I still get it, but here’s the thing: For me, time and time again, I’ve been doing this work for 10 years now, every single time I know that somebody is consciously turning on the, “I’m going to fake it,” all that does is engender, really further entrenches this deep-seated belief that they are fake. Here’s the other place I’d have you look. Root into what is true, and authentic, and legitimate about your existing capacity, your existing talents, your existing strengths, and work from there. That’s so much more enduring to embody what already exists for you. Rob: We see this a lot in the marketing world where somebody will shoot a video at fancy home they’ve rented or in front of cars that they don’t own. People want to look like they’ve got it all in order to sign on the next customer. I think there’s a real danger of people thinking that faking it until you make it is a viable business strategy. Even if that’s what you’re sort of feeling as part of the Imposter Complex, it’s not a good place to let your mind go. Tanya: Particularly for this audience, right, copywriting, the proximity to the heart. We feel the truth pouring off the pages, and we feel the dissonance when it’s not there. So just work from your strengths. Work from your existing capacity. Grow it to be certain. That’s our job. That’s our evolution, but just work from here because the last thing we need to do is to feed the Imposter Complex anything. It’s already got plenty of power. It doesn’t need any more. Kira: Yeah. I’m excited for #12. I feel like these all have been so good. What’s #12? Tanya: Okay, so here is my Imposter Complex kicking in. I’m kidding. Tanya: “I know I’ll never be able to pull that off again.” Yeah, asking help is for suckers. This is where we really want to stay alone again. After I did my TEDx Talk, I did give attribution to Pauline Clance. She’s been a huge advocate of my work. So I sent her these 12 lies, and she was like, “Yes, 1 through 11 you’ve got it, totally 100% yes.” Twelve, this was really tricky for her because the majority of her research was done back in ‘78. That was a very different time for women in academic industry. It really was truly legitimately a liability to ask for help. But now you can see it. You can feel it. The people who … Your people, once again, your people want you to succeed. Let them help you. You can see all of the places in your own life, in your own success where you have gone so much further, when you have allowed other people in to support you. Nine times out of 10 when somebody is at the precipice and they could use a little bit of help, but they’re afraid to ask for it, everything changes the moment they are open to that help. Rob: Yeah, so much good stuff. So we’ve covered the 12 lies. How do we cope with them? How do we fix it? Kira: Yeah. Please tell us. What do we do? Tanya: I have a little bad new before I got the good news. I just need you to know the reason I am so, I am literally at the edge of my seat right now, this is so huge because the behavioral traits are if somebody exhibit, if you’re experiencing the Imposter Complex, you’re going to try to avoid the experience of the Imposter Complex by going to one of these six behaviors and sometimes more than once. Procrastination, perfectionism, leaky boundaries, comparison, people-pleasing, and diminishment, so these are the things that you’re going to do to avoid. You’re going to make sure that people like you. You don’t want to feel like the imposter, so you’re going to make sure that people like you, but all of these behavioral traits are actually double-binds, which means that it has you coming and going. If your go-to … Mine happens to be people-pleasing, so I want to make sure that everybody likes me. It’s really important that I fit in and that people really like me. But guess what happens? When I’m invited to speak, when I’m invited to do something, my imposter complex wants to tell me it’s not because I am brilliant or talented or experienced or the expert in my field. It’s going to want to point out it’s just because they like me. That’s what creates this double-bind. It gets you coming and going. So your perfectionist tendencies are something that you go to as a result because of your Imposter Complex, but all that does is further entrenches your belief. This is where my mind just blew open. I just discovered this about maybe half a year ago that all of these behavioral traits, these behavioral attributes, they actually feed off of each other as well. So if you have leaky boundaries, then you might also be experiencing a lot of comparison. You might also be experiencing people-pleasing. You might be experiencing perfectionism. Again, 3.-however many billion people in the planet, it’s going to look a little bit different for everybody, and you don’t experience all of the lies at the same time, thank God, nor do you experience all of these behavioral traits at the same time, thank God. You’d never get out of bed if you did. But in some point or another, if you’re experiencing Imposter Complex, one of these behavioral traits is coming in, and that’s why it’s like this multi-headed Hydra. It’s so pervasive. Kira: I’m like, well, I’d have all of these behaviors all the time. It’s just very interesting, all of them. Tanya: Yeah, so that’s what we have to unpack it. Do you see? It’s just so up. Rob, how you doing? Kira: A little bit leaky. Tanya: But you’re comparing yourself to Kira, so okay, awesome. I just want to name that. Again, my intention is to let you like, this is part of the experience. So you’re not going crazy. It’s not a clinical diagnosis. This is something that happens to people with strong values of integrity, mastery, and excellence, and that’s what I’m here to talk about. Okay? That’s like, yay, you’re experiencing these things. If we break down those three objectives that it has, it wants to keep us out of action. It wants to keep us dead in our capacity, and it wants to keep us alone and isolated. Our strategies need to be focused on those three objectives. So I have a process that I call Step Into You Starring Role. There are six steps to it. They’re all equally important, but for those of you who are like jonesing to find the solution, we need to look at these three objectives. But I will back up and say our job as we decide what it is we want to do, we need to orient ourselves to the starring role. That’s the language that I use. So that starring role is an expression of your authority. It’s the expression of your next thing that you’re trying to move towards, and we’re always moving towards something. That’s what progress is. So just naming it is super important. What is it that we think that we want to be doing? Is it published author? Is it visionary? What is the thing that you really want to be stepping into? When I do this work with people, if it’s not actually wrinkling the Imposter Complex, then it’s probably not the next thing for you. You’re probably already the writer that you think that you want to be, but really it’s like this more … What is the deeper expression that wrinkles the Imposter Complex, because that’s your desire. Does that make sense? Kira: Yeah. So you’re saying when I’m in the kitchen cooking dinner, I could care less. I’m not a perfectionist because that’s not what I’m trying to master, basically. Kira: I’m not comparing myself to someone else in the kitchen. Tanya: Yep. You’re fine. Four food groups or three, three food groups are being handled for good, right? Tanya: Everyone’s alive. That’s fine. But in terms of the work, like industry leader, right? That might be award-winning. Whatever the thing is, just get clear on what it is. That’s huge for some people, and that really can keep people in a specific place. So that might be your work right there is to name your desire. The next place I have people look is to determine what your brand of joy is. So this is the real value’s work of what coaches tend to do, but this the real alignment. So for me, I’ll just break it down, I want to experience joy in everything that I do. I wanted to experience joy in this conversation, in my coaching, in my relationships. It’s how I want to feel in all that I do. I have to understand what brings me joy, and what brings me joy is going to be different for you, Kira. It’s going to be different for you, Rob. It’s certainly different for my husband. His word for what I call joy is success. Once you get that, oh my gosh, it really changes everything. We start to recognize how the places that we’re suffering, the places that are really the places that we’re out of alignment. So for me, what constitutes joy is generosity, connection, and gratitude. So when I’m out of joy, I know that I need to go back to that trifecta. So in this conversation I wanted to be as generous as possible. I wanted to be seriously grateful. I never wanted to take this for granted that I get to be having these conversations. And I want to feel connected to you two and everyone listening. So that’s how I access joy. Tanya: Yep. Every time I sit down to write a piece, how do I want to feel? I want to feel joy. How am I going to do that? Alright. So sometimes a connection will look like, “What does that mean?” I need to be more honest, or I need to be more connected to my intention or my desire for the person reading. Whatever it is, it’s going to mean something to me almost every time. But honestly it really, once I got this, it really changed everything for me. Rob: This feels like the kind of thing too that it’s not a five-minute exercise. I mean, it takes a lot of contemplation and thinking through. Really, where do you get that reward? That’s my invitation is to be thinking what your own brand of joy is because trust me when I tell you this does change everything. That helps you as you work with the Imposter Complex, which is the next … These are the next three steps in the Step Into Your Starring Role process. The first is you got to meet the critics. So this is right back to the original objective that it has to keep you out of action. It’s going to throw down all sorts of reasons you can’t step into your starring role: You can’t be the industry leader. Some of those will be realistic objections, and some of those will be inner critic objections. Some of them will be actual critics. We’re going to hear voices of people who are terrified of what’s going to change if we truly become an industry leader. Our job now is to deconstruct. Am I dealing with a realistic objection? If I am, what are the gaps I need to fill? Am I dealing with an inner critic? Alright. How am I going to deal with that inner critic? Am I dealing with an actual critic? Okay. How am I going to deal with that? So our job is to really, all of these blocks, get clear about what’s actually here. Again, so much simpler said than done, but that’s can’t get around it, right? We have to face these beliefs, these objections, and these people. And we got to take them down if we are serious about stepping into our starring role, which I believe we are. The next place is it has us doubting our capacity. This, we got to go inside before we go outside. But this is where we remind ourselves absolutely every single thing that we have done. And here’s where we like to step outside of ourselves. We like to stop. We want to discount our successes. That’s just like Imposter Complex 101. It’s going to have us discounting our successes. So we have to stay with it. We have to really look at all of the strengths. We have to look at the wins, what we have authored, what we have delivered, what we’ve sold, what we’ve healed, what we’ve survived. We have to look at all of it, and I mean all of it. Your job when you’re looking at bolstering your authority thesis is not so much to connect those two dots; it’s to remind yourself on a cellular level every single time that you have been on the precipice of your desires and jumped, and did the work in spite of the resistance, and so that the party was on the other side of that. Kira: So what are some examples of how we can do this? I’m just thinking through. It helps to have colleagues. So I’ll go to Rob if I’m dealing with Imposter Complex, and Rob is always very nice to me and will remind me of some things that I’ve done that are successful, so it seems it’s helpful to have people, the community maybe even just like saving those testimonials, positive emails in a special folder, but what else can we do? Rob: Because Rob is really not nice. We all know that. Tanya: Because it’s true. But that’s why I’m really wanting to point you to inside job first because when we are then bolstered from the inside, recognizing our own strengths, our own capacity, one, we can start looking to external validation to the tweets, to the testimonials, to the amazing feedback, to all of those things, and definitely gather those in a physical folder. So brag #4, or 5, or 6, I don’t know, one of my dearest friends from high school just got assigned as Bureau Chief of Canada for the New York Times. She’s literally the only Canadian for The New York Times right now. There’s like some guy, there’s somebody in Ottawa, so this is a big deal. One of the ways that she felt confident to get on that plane to go to New York was looking at this physical folder of testimonials, and awards, and all of the times that she has been reminded by others just how remarkable and life-changing her writing really is. It’s so deeply important. So inside, and then you can go outside because then it’s not like water off a duck’s back. You can actually allow the accolades, the acknowledgements to start to seep in, particularly if you are a people-pleaser. Then the third strategy, again wants to keep you alone and isolated, this is where you assemble the cast. Make sure that you are surrounded by people that can see you, that are willing to reflect back what they see. This is really getting mindful about who you’re surrounding yourself with. You have each other, and you can see the way you compliment each other is glorious to witness, really. Who else is on your cast? Who are the people that can remind you of your strengths? Who are the people who can help to point out when you are buying into a specific lie or when you are stuck in one of those behavioral traits? Who are those people? and really trying to round out the experience of your life with the people that will remind you all that you are, remind you to bring more fun into your life, so just really looking at the kind of support you want, the kind of support you need, the kind of support you’d love to have. Then we’ve got all of this. We’ve got we know what we’re doing. We know how we’re doing it. We’ve met the critics. We’ve bolstered our authority thesis. We’ve assembled the cast. Now you got to do the work. You’ve got to do the work of writing, of coaching, of pitching, of baking. Whatever it is that you need to do, you need to do the work. Malcolm Gladwell speaks of the 10,000 hours it takes to become a world-class expert. But I think it’s more like 10,000 choices. What are we choosing to do when somebody else’s needs come up in front of ours? Every single person on your show, every conversation you’ve had comes down to there is no real shortcut to mastery, that that’s in this work. It’s the doing of the work. I think it’s really important that we make sure that we hit on #6, and that’s celebrate because we are so quick to move on to the next. That’s how the ego works. It wants to want more than it wants to get. So we forget this part. We forget to integrate. We forget rest and remind ourselves that this felt state of accomplishment is good. It’s good. Tanya: That’s why it’s so hard for us to go back to listing our accomplishments, because we don’t take the time to note them, to celebrate them, to go over them. Kira: Right. We’re not having the celebratory parties to celebrate everything we’re doing well. Rob: Tonya, I want to ask because I imagine that there’s somebody out here that’s listening to this and thinking, “I didn’t win the spelling be in seventh grade. I didn’t graduate with great grades. My marriage has failed. I got fired from my job. I don’t have any of that stuff to celebrate or to fall back on, and I really, truly am an imposter.” What would you say to that person? Tanya: I would go back to actual imposters don’t feel like imposters, very, very first place. Then I would get even more granular about what is it that you’re deeply wanting. So spelling bee, marriage, driver’s license, that’s another place we like to hide out. All of these things that I didn’t do, what did you do? What did you do? And how does that actually connect to your desires? We’re talking about copywriting, for instance, because now that we’ve opened this up, sure we’re talking about copywriting, but we’re also talking about all sorts of other things in our life. But what is it that you deeply desire? And then how do things line up to bolster your authority in that specific area? So what have you authored? What have you written? If it’s been a dismal failure after dismal failure, what is that desire still actually about? And where did that person leave themselves in their own writing that’s still calling them back? Because that’s what’s happening for that person right there. What if I wrote in my way? Kira: Tanya, I know we’re at the end of our hour and our time together, and this has been just so fascinating for both of us, I’m sure. For listeners who are like, “Okay, you’ve shared all of this. I just kind of want a hack. I just want to feel like I’m not an imposter, and kick the perfectionism and procrastination and all of that today.” Is that even possible? What’s next? Now that we know all of these things that you’ve shared with us today, what do we do with all of it? Tanya: First of all, just I’m going to say it again, actual imposters don’t feel like imposters. So if you’re experiencing it … And sometimes that might just be enough for you to go, “Oh, okay. The fact that I’m experiencing this, A, means that I’m not an imposter, and, B, means that I have strong values in mastery, integrity, and excellence.” That might be more than enough to get you to make that next pitch. That might be all that you needed today, and that’s fantastic. If you want to next-level this, that’s when you really start to look at, “What are my limiting beliefs? Why do I keep coming up against this? I’m super frustrated. I know that I’m better than this, but I keep coming up against it.” So that’s where you start getting pretty granular about meeting the critics, about bolstering your authority thesis, and about making sure that you ware surrounded by the best of the best of the best. Rob: Such good stuff. Like Kira just said, we’ve used up our hour. I feel like we’ve been on the couch with our personal business coach and psychologist. You’ve just given us so much to think about and to even work on. Tanya, if people want to connect with you or find out more about you, see your TED Talk, where would they be going to get all of that stuff? Tanya: Tanyageisler.com is my site, and they can email me tanya@tanyageisler.com. On my site, you’ll find the 12 lies of the Imposter Complex. You’ll find a very short four-video series called The Imposter Complex 101. Super fancy. I have the Step Into Your Starring Role Playbook, which is an 11-week self-guided exploration. It’s pretty amazing stuff. When you do that, you actually get office hour calls with me as well. Tanya: Thank you so much for having me. Kira: Thanks for showing up, and connecting, and empowering your trifecta, and connecting with us, being grateful, giving so much to our community. It’s just been really powerful. Thank you. Rob: Yes, so good. Thank you. Tanya: It’s totally my joy. Thank you.